Those of you who know me well will find what I’m about to explain unsurprising. I am not a stylish person. I make no effort to present myself in the latest style. I rarely make a fashion statement. I don’t go out of my way to be out of style either (this would involve understanding what the current style is, which I don’t.) This aspect of my personality has led to some interesting interactions. One of my favorites involves my beautiful sister, who has a very good sense of style, and seems to me to represent what is in style the way most other women wish they could. Years ago my sister and her husband were visiting the homestead for a few days. We were outside walking around when she said to me, “I like your pants.” I almost never hear those words. I looked down at my blue jeans, both of whose knees were ripped out, in addition to some tears near the pocket. As I struggled in the quicksand, I grabbed for some branch of sanity, and dimly came to remember an NPR story I’d recently heard about ripped jeans currently being in style, and the clever way manufacturers had of making them appear so. My sister’s quick eye probably told her the difference between my legitimately work-worn jeans, and the fakes in the store, and she couldn’t help but compliment me for my unintentional lapse into stylishness. 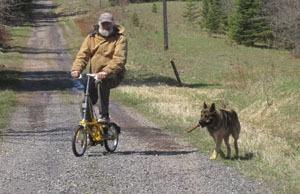 Some time ago, I was trolling eBay for a pair of Dahon folding bikes that I hoped we could use post retirement when we traveled. I did eventually find 2, fixed them up, and used them a few times. Alice calls them our “circus clown” bikes. At 6’2″ and about 200#, I do look a bit out of place on this bike, but carrying my weight is exactly what this bike is designed to do. Modern Dahon’s look almost nothing like the ones we have, which is probably part of the notoriety the bike achieved. Whatever the reason, for about the second time in my life, I was temporarily back in style. This entry was posted on Thursday, October 25th, 2012 at 8:20 pm and is filed under Uncategorized. You can follow any responses to this entry through the RSS 2.0 feed. You can leave a response, or trackback from your own site.